This day trip will provide you with a lovely drive through the park, history of the Townsend area, and a couple of the best-known attractions in Gatlinburg. It can be done in one busy day, but I’d leave after breakfast, do Townsend first and end up at the Aquarium last. If you eat dinner in Gatlinburg you might make it back to Gracehill Bed and Breakfast in time for sunset and a soak in the hot tub. The Little River Railroad Museum will take about a half an hour unless you are a railroad aficionado, if so, plan on an hour. The Little River Railroad was a subsidiary of the Little River Lumber Company both owned by Col. W.B. Townsend, our town’s namesake, who acquired over 76,000 acres. The railroad was built to service his sawmill located in Townsend at the turn of the 20th century. The railroad ran from Maryville, through Walland to the Townsend “Y” where it split. The west branch went up toward Tremont, the east branch to Elkmont. After cutting about two billion board feet of lumber, Col. Townsend sold his holdings to the Great Smoky Mountains National Park for about $3.58 acre. Many of our roads and trails follow the old RR beds, although none of the track was left behind when the company left. On the other side of the street, up a couple of blocks, you will see the Townsend Visitor Center. They have some great books for sale, helpful people, and the adjacent exhibit room often have craft experts plying their trade. The difference between the Townsend Visitor Center and Sugarlands Visitor Center (on the outskirts of Gatlinburg) is that Sugarlands is the Great Smoky Mountains National Park headquarters. There, the selection of items to buy is considerably bigger. They have permanent exhibits on flora and fauna, a 15- minute movie you can watch in the amphitheater and a much larger staff. 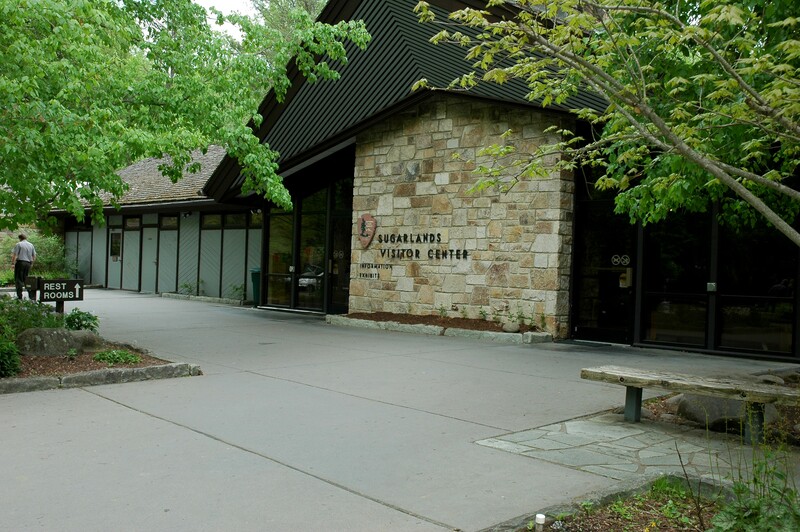 However, before you leave Townsend, make a stop at the Great Smoky Mountains Heritage Center. Plan for an hour or two. Although the brain child of a few local citizens, personally, I’d say this museum got its start from the large archeological dig that ensued when TDOT came in to widen the highway 15 years ago. Once the first grave and artifacts were found, locals watched the University of Tennessee remove soil, layer by layer for years. A trip to the Center includes interactive tours of archaeological and cultural artifacts and a number of outdoor historical buildings that were moved onto the 5-acre site. Once back in the car continue on to Sugarlands or the Ober Gatlinburg Tram. If you don’t want to take the tram up, you can drive to the top of Ski Mountain, where the main facility is located, by turning at stoplight # 10 and just following the road to the top of the mountain. (I think taking the tram is the best part of Ober Gatlinburg.) Years ago, Ober Gatlinburg was a place to go skiing, ice skating, or sledding down a cement “alpine” slide, kind of like the luge in the Olympics without the ice! Now they have added water rides, a maze, animal exhibits, restaurants and games “galore”! Finish at Ripley’s Aquarium with a leisurely stroll through many different exhibits. I’ve been in a number of aquariums and this one is probably the most unique. There is an acrylic tunnel on a 340-foot long “glidepath” with sharks swimming overhead. Music from Jaws builds in the background…. 😉 Get up close and personal petting the stingrays. 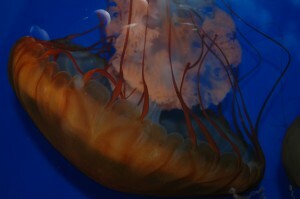 The colors throughout are just beautiful whether you are looking at coral reefs, jellyfish or the sea gallery. Admission is worth the price. For a good restaurant in Gatlinburg check Day Trip Two.